What do you do when you see a group of brilliant poets wandering in the wild, bloody north? Publish their poems, of course! 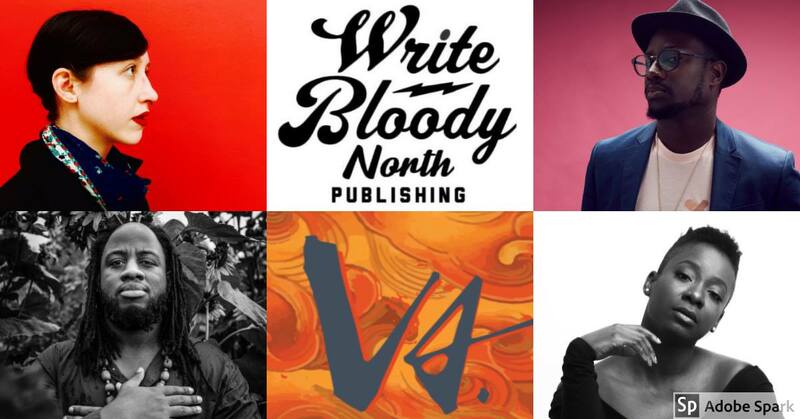 Canada’s hottest, new publisher, Write Bloody North, launches its first wave of authors, including World Poetry Slam Champion Ian Keteku, international star Titilope Sonuga, 2-time national slam champion Brandon Wint and local darling Lucia Misch! Titilope Sonuga is an award-winning poet, writer, and performer who renders both in verse and in performance, a remarkable elegance of craft, a quality of rootedness and an unflinching womanhood that has made her an internationally celebrated artistic voice. She has graced stages across Canada and the globe and is the first poet to perform at a Nigerian presidential inauguration, performing an inaugural poem in May 2015. // She was a speaker at TedxEdmonton in 2014 and served as the 2015 2016 ambassador for Intel Corporations She Will Connect Program in Nigeria, advocating for women and girls in the STEM fields. She has published two collections of poetry, a spoken word album and had her work translated into Italian, German and Slovak. Her next collection, This Is How We Disappear, is forthcoming in 2019. Brandon Wint is a nationally acclaimed poet, spoken word artist and arts educator based in Edmonton, Alberta, Canada. Brandons work as a writer exemplifies a deep attention to the craft of poetry, the nuances of language, and the social power of words. As a performer, Brandon Wint displays the poise, passion and spiritual generosity of one who has graced stages across the country at music festivals, conferences, universities and grassroots events alike. Brandon is a poet whose work has garnered praise and attention in a variety of mediums. He is a two-time Canadian national poetry slam champion. In print, he is the author of one chapbook, Love, Our Master (In/Words Magazine and Press, 2014) and was a contributor to the only comprehensive anthology of Black Canadian poetry, The Great Black North (Frontenac House, 2012). Brandon has also released three recording projects, including Devotion EP (2015), The Long Walk Home (2016), and his most recent album, Infinite Mercies, which he showcased at the second annual Black Arts Matter festival in February of 2018. His first book of poetry, Divine Animal, is forthcoming from Write Bloody North in autumn 2019. Lucia Misch is a writer and performer from the Bay Area. She has presented her work across North America, on stages ranging from literary festivals to union conventions to local poetry slams, and her writing has been published in print and online. A veteran arts educator, Lucia facilitates writing workshops for youth with WordPlay: Poetry In Schools, as an ArtStarts Poet in Residence, and a teaching artist at creative arts camps along the West Coast. She lives and works on the unceded territory of the Musqueam, Squamish, and Tsleil-Waututh people.